Top scientists, policy makers and industry leaders are gathering in Washington this week for a four-day symposium that will feature discussions about the past, present and future health of the ozone layer. Some key questions on the agenda: To what degree are climate change and ozone depletion interconnected? And how can leaders apply lessons learned while confronting the ozone problem that dominated headlines in the 1980s to the threats posed by global climate change? In 1987, delegates from 24 nations signed the Montreal Protocol, a landmark piece of legislation that set limits on emissions of ozone-depleting substances known as chlorofluorocarbons (CFCs). Since then, every country in the world has followed suit. The video above shows what could have happened if countries had failed to regulate CFCs. But while the Montreal Protocol began the process of closing one chapter of the ozone story, the ozone layer still requires careful monitoring because other substances in the atmosphere – including climate-altering greenhouse gases – can also affect it. In the Q & A below, NASA Goddard atmospheric scientist Paul Newman offers his perspective on why the ozone story isn’t over, and how climate change will likely impact the evolution of the ozone layer in the future. To see daily updates on the health of the ozone layer, please visit Ozone Hole Watch. The ozone layer is on the road to recovery. Why is it still such a hot topic among scientists? It’s important to continue monitoring ozone because it’s so vital to life on Earth. Surface measurements and satellite observations confirm that ozone isn’t declining in our atmosphere anymore, so the Montreal Protocol is working. But ozone is impacted by many factors, not just CFCs. The Earth’s natural variations – like volcanic emissions, climate change, and the sun – can all impact ozone. Also, technological innovations like high-altitude aircraft or industrial chemicals can also impact it. So the ozone story isn’t over. It’s evolving. If all of these factors influence ozone, can we say with certainty how it will change in the future? The ozone layer is recovering from the effects of CFCs, but because of climate change, it will recover to different levels than its natural pre-industrial state. Our models show that we’re not going back to the old ozone layer, we’re going back to some new version of it. Our models also show that climate has a very different impact on ozone depending on whether you’re in the troposphere or the stratosphere. What’s the difference between the troposphere and the stratosphere? The troposphere is the lowest layer of our atmosphere, on average, extending up to about 7 miles above the Earth’s surface. Our day-to-day weather happens in the troposphere. The stratosphere extends from about 7 to 30 miles above the surface. While ozone is extremely important for screening harmful solar ultraviolet (UV) radiation, it’s a dangerous air pollutant at the Earth’s surface. Fortunately, about 90 percent of the planet’s ozone is in the stratosphere, while only 10 percent of is in the troposphere. What about greenhouse gases? Do they also have different effects in the troposphere and stratosphere? Greenhouse gases have much different effects in the troposphere and stratosphere. Carbon dioxide both absorbs and emits infrared radiation. In the troposphere, increased levels of carbon dioxide and other greenhouse gases block outgoing radiation, increasing the surface temperature. In the stratosphere, the increasing carbon dioxide concentrations allow greater radiation to space, cooling the stratosphere. So greenhouse gases warm the surface and cool the stratosphere. How will climate change affect ozone in the stratosphere? How do you think the lessons learned from the ozone hole story are relevant to the climate change story? There are two important science lessons from the Montreal Protocol. The first lesson is that solid science is the foundation for policy. The quality of both ground and satellite ozone observations can now detect a 1 percent change over a 10-year period. Policy makers relied on these estimates from scientists to formulate options on the regulation of ozone depleting substances. As the science evolved, the Montreal Protocol was strengthened. The science of climate change has seen similar improvements over the last few decades. Scientists continue to improve the quality of both observations and models of climate change. The improved quality of the science allows for the formulation of effective policy. The Montreal Protocol demonstrates that the nations of the world can act together to solve a global problem. National boundaries are irrelevant to the stratospheric ozone layer. Emissions from countries in the Northern Hemisphere mainly caused the Antarctic ozone hole in the Southern Hemisphere. The nations of the world recognized the problem and acted together. This involved efforts between policy makers, technologists, scientists, industry, and non-governmental organizations. Technologies for replacing ozone-depleting substances have now been developed, and levels of these substances are now decreasing in our atmosphere. But we need to continue monitoring ozone and tracking how it reacts to climate gases. The story isn’t over. Text by Alison Ogden. Videos from the Scientific Visualization Studio. Ozone vertical distribution graphic from Ozone Hole Watch. Image of Paul Newman originally published here. The NPOESS Preparatory Project (NPP), NASA’s newest Earth-observing satellite, roared into space on October 28th on a mission to improve understanding of how Earth’s climate (and weather) works by extending a variety of environmental data records established by an earlier generation of satellites. There’s been plenty of good coverage of the hubbub and the careful engineering that goes into every NASA launch but less that gets into the nitty-gritty of the new science data that the satellite will provide. 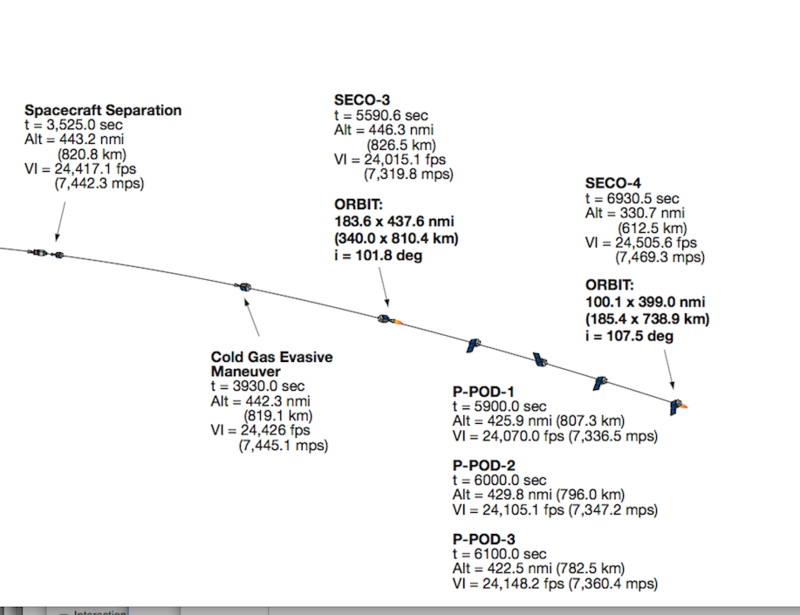 What exactly will the mission’s science team do once NPP starts to produce data? What sorts of science issues will NPP-funded researchers tackle? The answers to such questions are tucked away in a hard-to-find document (pdf) in the science section of NPP’s website. Though technical and filled with acronyms and jargon, it’s well worth reading if you want to understand what the NPP science team will be focused on in the coming months. My four sentence summary: Teams of researchers charged with using NPP to monitor a whole slew of environmental phenomena (think, for example, atmospheric ozone levels, sea surface temperatures, cloud properties, fire activity, vegetation cover, ocean color, land surface temperatures, aerosol particles, snow cover, the planet’s albedo, and air pollutants such as sulfur dioxide) will be doing everything they possibly can to make sure the data NPP’s instruments provide can be merged seamlessly with measurements taken by an earlier generation of satellites. Sounds easy enough, I know. It’s not. Lots and lots of careful calibration and validation work is required because four of NPP’s instruments are significantly different than the instruments that preceded them. To the NPP scientists about to embark on the task: Bon Voyage! Text by Adam Voiland. Launch #1 video published originally on Geeked on Goddard. 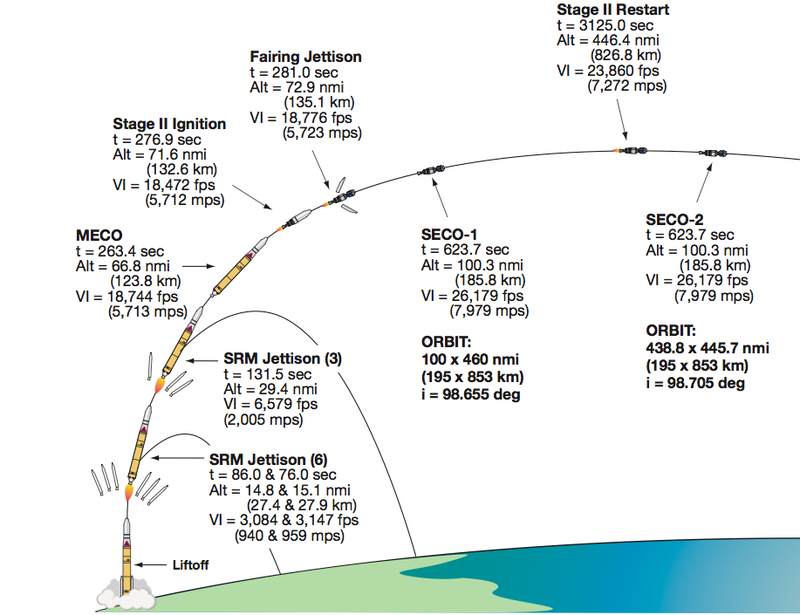 Launch imagery available in the NPP press kit. Launch video #2 published originally by NASA Television’s YouTube Channel. Here at What on Earth, we’re constantly stumbling across interesting photos, videos, and audio clips from NASA’s exploration of our planet (be it from space, the field, or the lab.) Whether it’s a satellite montage captured from thousands of miles up, the roar of our B-200 research aircraft, or a microscopic view of a cloud droplet, there’s literally always something strange and wonderful passing across our desks. It will have some relation to what we do at NASA. We’ll give you a week to post your guesses, and we’ll post the answer the following Friday. So, what on Earth was that? We received a barrage of thoughtful—and creative—responses that ranged from pollen, to DNA, to carbon nanodiamonds embedded in Antarctica ice. Ant-related answers were surprisingly common. (Nope, it isn’t an ant eating salt, spitting up acid, or laying eggs.) 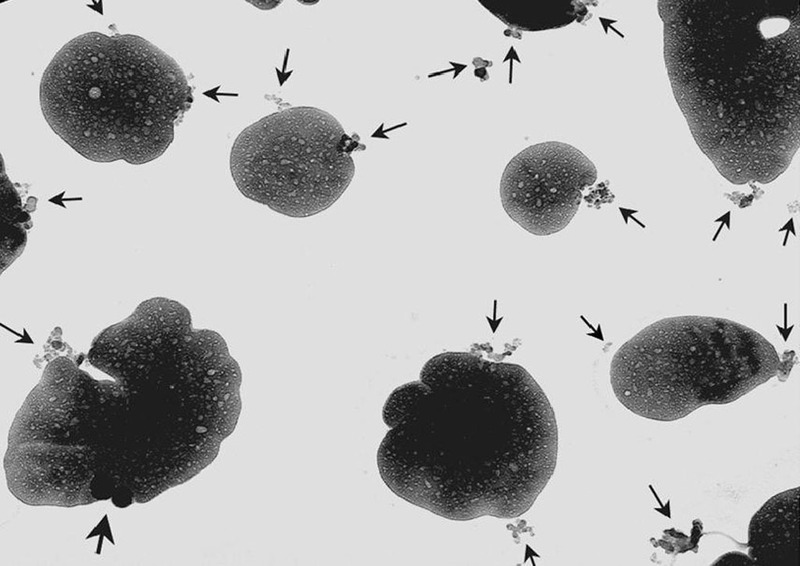 It is, drum roll please, a microscopic view of soot from wildfire smoke in Africa. Congratulations to posters MicroMacro (comment 121), Arbeiterkind (comment 124), Mike (comment 125), Michael & Marion Dreyer (comment 130), and Rosemary Millham (comment 141), who were correct or on the right track. A more complete description of the aerosols from this particular fire, including the image above, was published in the Journal of Geophysical Research (account required). Here are a few more details to impress your pals: Bits of soot (a type of aerosol particle) tend to clump together into the chain-like structures visible above. Wildfires, diesel trucks, factories—anything that partially burns the carbon locked away in fossil fuels and organic materials can produce soot and release it into the air. Soot makes doctors nervous as it can cause health problems when it lodges in our lungs and works its way into our bloodstream. And climatologists are wary of the particles as well because they absorb the sun’s energy and hasten global warming and climate change by heating the atmosphere directly or coating the surface of glaciers. In recent years, black carbon is an active area of research in climate science, and it’s a target of study for a number of NASA’s Earth science projects, including the forthcoming Glory satellite. Image(left) from Peter Buseck, Arizona State University. Image(right) from Jim Ross, NASADryden Flight Research Center. 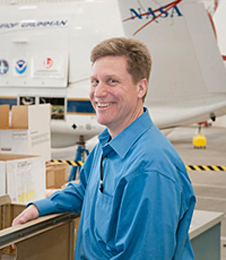 Gavin Schmidt, a climatologist based at NASA’s GoddardInstitute for Space Studies (GISS) in New York City, has received the inauguralClimate Communications Prize from the American Geophysical Union, the largestassociation of Earth and planetary scientists in the world. The $25,000 prizewill be awarded at the group’s fall meeting in San Francisco thisDecember. Despite the rancor that often surrounds public discussions ofclimate change science, Schmidt has become one of NASA’s most valued andrelentless scientific communicators. He is regularly quoted by leadingnewspaper and magazine journalists, frequently offers his time and expertise atpublic events, and has appeared on numerous television programs. In his sparetime, he write for the widely read blog RealClimate and has published abook about climate change. Here are a few links to interviews we’ve done with Schmidt in the past about communicating climate science and the surface temperature record. Also, take a look at these recent video interviews produced by Columbia and NASA and a few of Schmidt’s memorable appearances on CNN, the Daily Show, Nova, and Martha Steward (see 9:50). Congratulations, Gavin. And thank you. The blanket of sea ice that floats on the Arctic Ocean appears to have reached its lowest extent for the year. Arctic sea ice extent fell to 4.33 million square kilometers (1.67 million square miles) on September 9, 2011. This year’s minimum was the second lowest in the satellite record, which started in 1979. The lowest extent was recorded in 2007.Over the last thirty years, ice extent, a two-dimensional measure of the ice cover on the Arctic Ocean, has declined in all months, with a more pronounced drop in summer. Scientists attribute this decline in large part to climate change. Arctic sea ice melts and refreezes in an annual cycle, reaching its lowest point in late summer, and its highest point in late winter. Sea ice goes through this shrink-and-swellrhythm every year, but since consistent satellite observations began in1979, both the annual minimum at the end of summer and the annualmaximum at the end of winter continue to decline in area and thickness.Consistent with rising temperatures globally and specifically in theArctic, climate scientists are concerned with this trend both as anindicator of climate change and as a feedback mechanism. As the white,highly reflective ice disappears, darker ocean waters appear. Thisdarker surface absorbs more solar radiation and acts as a positivefeedback to the warming that is already occurring and causing the changein the first place. On Sept. 20th, NASA’s Cryosphere Program Manager, Tom Wagner, shared his take on Arctic sea ice with television audiences across the country. Text by Adam Voiland. Visualization by the Scientific Visualization Studio based at Goddard Space Flight Center. Texas Burns But What&apos;s the Global Fire Trend? Wildfires that have destroyed more than a thousand homes and threaten thousands more continue to rage in central Texas. Meteorologists point out that drought and an influx of wind from Tropical Storm Lee have fanned the flames and fueled the rash of fires, the most severe Texas has experienced in recent memory. But what do we know about the broader context of the fires? Can we say with any certainty, for example, that fires have become more common in the United States – and across the globe – in the last few decades as global temperatures have increased? The answer to that question, I found after hunting through various journal articles and checking in with some of Goddard Space Flight Center’s fire specialists, is complex. Satellites offer the most comprehensive and reliable measure of the amount of land burned each year; however, satellite-based records of fire activity are still relatively brief. Still, Giglio and his colleagues have pieced together hints of trends that are worth noting. 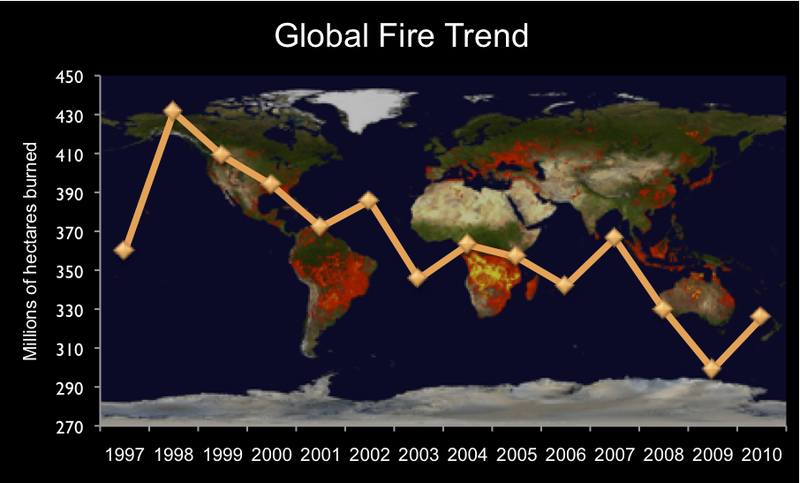 Between 1997 and 2008, they show that the number of hectares burned across the globe has declined a significant amount from a maximum in 1998 to a minimum in 2008 (see graph above). 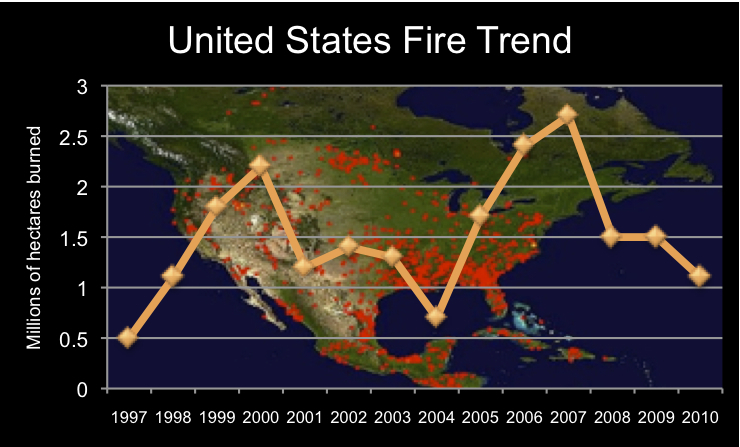 The area burned in the United States, which is less than a percent of the total area burned each year, has seen peaks in 2000 and 2007 (see graph below). What’s driving the global decline in area burned? The topic is ripe for more research, but when I asked Giglio that question he reminded me that, contrary to what one might expect, increasing global temperatures and drought do not invariably produce increases in fire activity. The local vegetation and climate makes a big difference, Giglio explained, noting that in certain water-limited areas, such as portions of Australia and Africa (parts of the world where the majority of burning occurs), drought can actually make wildfires less likely to occur by limiting the growth of fuel. The opposite, however, is true in places that receive moderate amounts of rain during the wet season, such as the western United States, a region for which its thought that drought will increases fire activity. For more on this topic, read Giglio and Randerson’s study in the journal Biogeosciences. For more on how satellite are used to monitor wildfires, visit the University of Maryland’s MODIS fire monitoring page. For coverage of breaking fires, visit NASA’s Smoke and Fire page and the Earth Observatory’s Natural Hazards Fire page. For a NOAA website that highlights fire trend data, visit this page. Text and graphs by Adam Voiland.Graphics based on satellite-derived burned area data published by Louis Giglio in 2009 (see table 2). 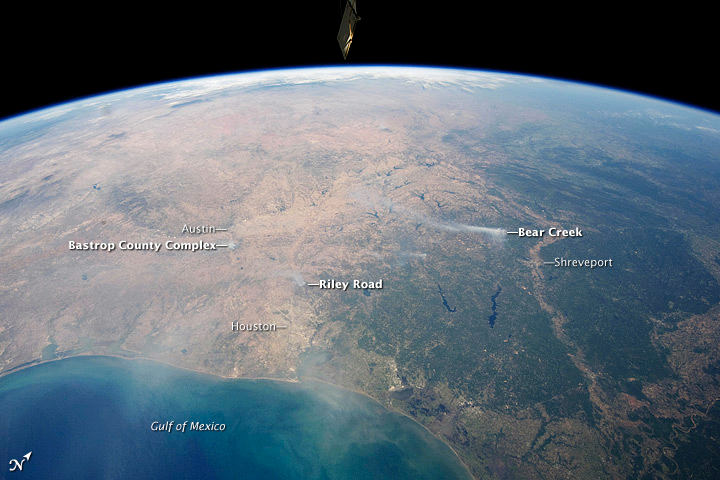 Panoramic view of Texas wildfires captured by an astronaut on the International Space Station. Annotation by the Earth Observatory. Author avoilandPosted on September 8, 2011 March 8, 2013 Tags General3 Comments on Texas Burns But What&apos;s the Global Fire Trend? 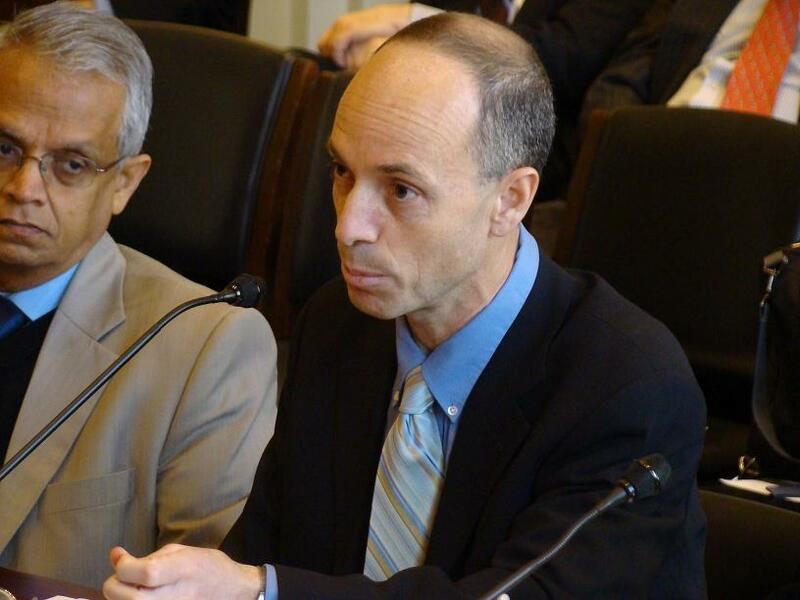 Leading aerosol scientists, including NASA’s Drew Shindell, explained the intricacies of a sooty component of smoke called black carbon to members of the Select Committee on Energy Independence and Global Warming during a hearing on Capitol Hill last month. Their message: controlling black carbon emissions could be a win-win for both human health and the environment. Not only can partially combusted particles of carbon lodge in the human respiratory system and cause disease, the panelists explained, they also contribute to climate change by warming the atmosphere and changing the way Earth reflects sunlight back into space. Three lawmakers—Representative Edward Markey (D-Mass. ), Representative Jay Inslee (D-Wash.), and Representative Emanuel Cleaver (D-Mo. )—questioned the scientists. • One ounce of black carbon absorbs as much sunlight as would fall on an entire tennis court. • A pound of black carbon absorbs 650 times as much energy during its one-to-two week lifetime as one pound of carbon dioxide gas would absorb during 100 years. • An old diesel truck driving 20 miles would emit about one-third of an ounce of black carbon and 70 pounds of carbon dioxide. The carbon dioxide from that truck would have five times the warming power of the black carbon, but it would spread out over 100 years. The truck’s more potent black carbon impact would have an effect in the span of a few weeks. Drew Shindell, a climate modeler from NASA’s Goddard Institute for Space Studies (GISS) in New York City, provided more details about where black carbon comes from and how much impact it has on Earth’s climate. Diesel vehicles, agricultural burning and wildfires, and residential cooking stoves are key sources of black carbon. However, combustion that occurs at higher temperatures — such as the type that takes place in power plants — does not produce much of the substance. Shindell said climate models from NASA GISS and elsewhere show that 15 to 55 percent of global warming is due to black carbon. The wide range is primarily because of incomplete knowledge about how black carbon and clouds interact. One of the more interesting questions came from Rep. Inslee, who asked the scientists whether black carbon’s impact is due to the fact that it absorbs sunlight and warms the atmosphere, or because it covers snow and ice with dark soot, which reduces Earth’s albedo and makes the planet less reflective. Shindell added that the scientific understanding of black carbon’s impact varies by region. “In places like the Himalayas, the results are somewhat ambiguous,” said Shindell. Over Himalayan glaciers, large amounts of dust — which also absorb radiation — and other pollutants in the air may dampen the effect. “In the Arctic, which tends to be very far from dust sources, the snow is very clean, so the effect is extremely large.” Increasing levels of black carbon combined with decreasing levels of sulfates may account for more than half of the accelerated warming in the last few decades, Shindell’s research suggests. Drew Shindell testifies as Veerabhadran Ramanathan looks on. As Hurricane Irene strengthens and threatens the East Coast, it seems a particularly apt time to dust off this 2007 video that explains how hot towers – immensely tall cumulonimbus clouds at the center of tropical cyclones – play a key role in strengthening storms. In 2004, researchers at Goddard Space Flight Center found that a tropical cyclone with a hot tower in its eyewall (the part of a storm the most damaging winds and rain occur) was twice as likely to intensify within the next six hours than a cyclone that lacked a tower. NASA satellites did, as detailed here, observe hot towers in Irene before forecasters elevated the storm to hurricane status. Text by Adam Voiland. Image from the Earth Observatory. Most people know climate change is causing glaciers to retreat in Earth’s polar regions, but that’s hardly the only change warming temperatures can produce. A new study, led by Frida Bender of the Scripps Institute of Oceanography and published in Climate Dynamics, shows that the tracks of mid-latitude storms – the type that drives the weather systems that affect Americans the most – have shifted poleward and narrowed over the last 25 years as a result of climate change. 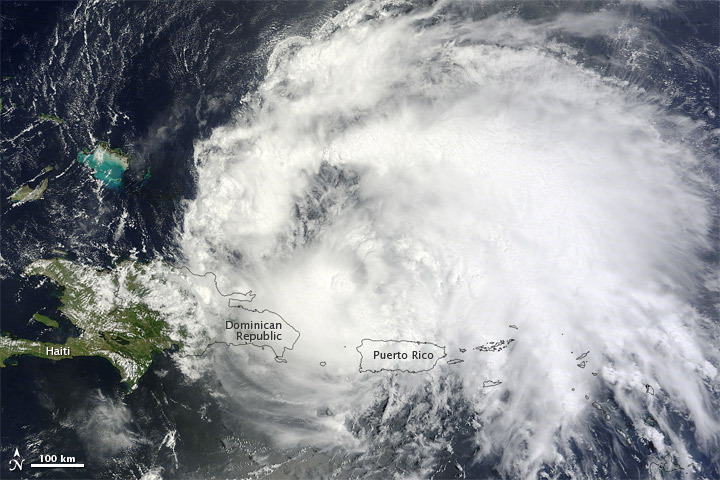 What’s more, as the Jet Propulsion Laboratory’s Graeme Stephens notes in a Nature Climate Change article about the study, Bender’s satellite-based research shows that the cloudiness of the storm tracks has decreased over the same period. That’s important as it suggests the decline may have increased the net flux of radiation at the top of Earth’s atmosphere over storms – a process that could amplify warming over time. In March of 2011, the World Meteorological Organization put out a statement announcing an unprecedented loss of stratospheric ozone over the Arctic. Between the beginning of winter and late March ozone levels declined by 40 percent due to unusually cold temperatures in the Arctic stratosphere. (Cold temperatures hasten ozone destruction by making it possible for a certain type of cloud to form that hosts ozone-depleting chemical reactions). But what caused the cold spell? A new study authored by Margaret Hurwitz of Goddard Space Flight Center and published in Atmospheric Chemistry and Physics Discussions points out that unusually warm sea surface temperatures in the North Pacific likely played a key role. The phase of the solar cycle, greenhouse gas emissions, nor El Niño/La Niña oscillations can fully the explain the unusual conditions, she notes. Can Satellites Help Save the Burrowing Owl? 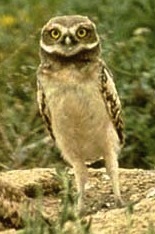 Burrowing owls, one of the world’s smallest owl species, live in the abandoned tunnels of small mammals such as ground squirrels and prairie dogs. The long-legged birds, which typically weigh just 6 ounces, are losing ground to development and some conservation groups put the number of breeding burrowing owls at a mere 10,000. A new study, published in the Canadian Journal of Remote Sensing, suggests that crop classification imagery from Landsat satellites could be used to evaluate owl demographics and help with conservation plans as agricultural areas experience short-term changes. Speaking of LandSat, Landsat 5, launched in 1984, is still operating more than a quarter of a century later despite having an original design life of three years. However, the reality that LandSat 5’s critical Thematic Mapper instrument, which many agencies around the world rely upon, won’t last indefinitely is becoming increasingly difficult for scientists to ignore as the satellite ages. Since Landscape 6 failed to reach orbit and LandSat 7’s Enhanced Thematic Mapper, which reached orbit in 1999, has a glitch that omits key strips of images, there’s a real possibility that top-tier LandSat images won’t be available until the Landsat Data Continuity Mission launches in December of 2012, a new study in the Canadian Journal or Remote Sensing cautions. The Australian authors of the study tested some of the alternative satellite data products, but none of them quite measured up to LandSat 5 in their view. Climate models generally assume that the carbon agricultural crops take up later reenters the atmosphere in approximately the same geographic area, but in reality food gets shipped long distances before we consume it. A new paper, authored by Tristram West of the Pacific Northwest National Laboratory (PNNL) and published in Biogeosciences, accounts for the mobile nature of food and shows how regions that rely on food from distant areas end up releasing the carbon that comes with it into the atmosphere. Overall, as noted in the PNNL press release, the researchers found that crops take in — and later return — about 37 percent of the U.S.’s total annual carbon dioxide emissions, but that the amount varies significantly by region. Agriculturally active regions of the Midwest, Great Plains, and along the southern half of the Mississippi (shown in blue below) release more carbon than they take in, while more urban parts of the Northeast, Southeast, Western U.S. and Gulf Coast (shown in red below) take in more than they release. Text by Adam Voiland. 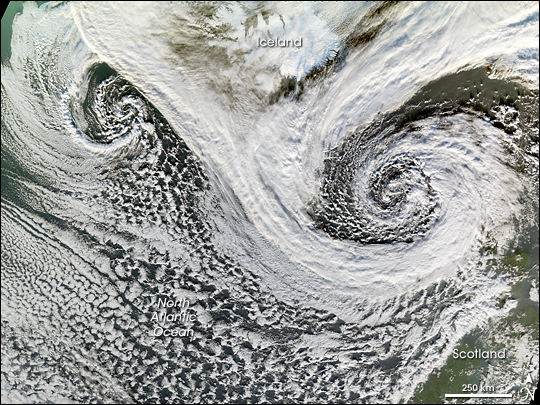 Extratropical storm imagery from the Earth Observatory. Burrowing owl imagery from the city of Boulder. Agricultural carbon sink and source map from Science Daily. Here at What on Earth we’re offering an extra special “no prize” if you can correctly identify the large blob-like objects and the smaller objects pointed at by the arrows. Post your guesses in the comments section, and check back next week for the answer.